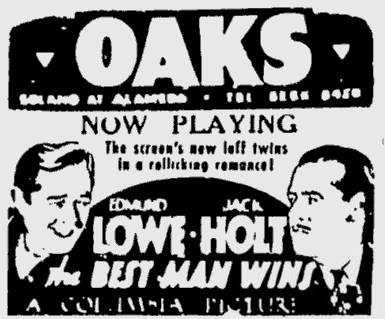 The tale of two ex-friends in love with the same girl and on opposite sides of the law featured Bela Lugosi as a jewel smuggler. 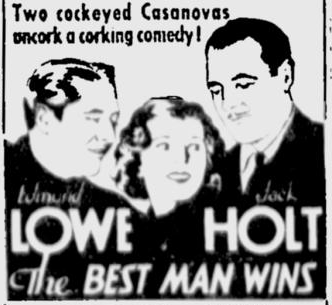 Lugosi also appeared with Edmund Lowe in The Silent Command (1923), Women of All Nations (1931), Chandu the Magician (1932) and Gift of Gab (1934). 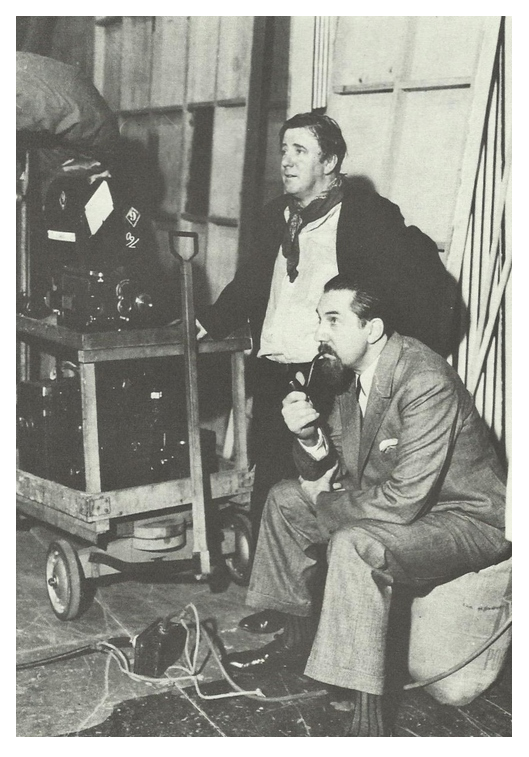 Director Erle C. Kenton had previously directed Lugosi in Island of Lost Souls (1932). 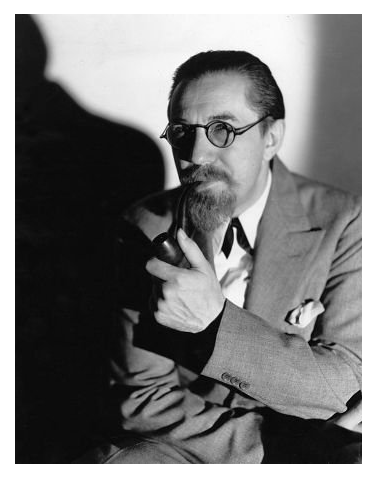 Assistant Director: C.C. 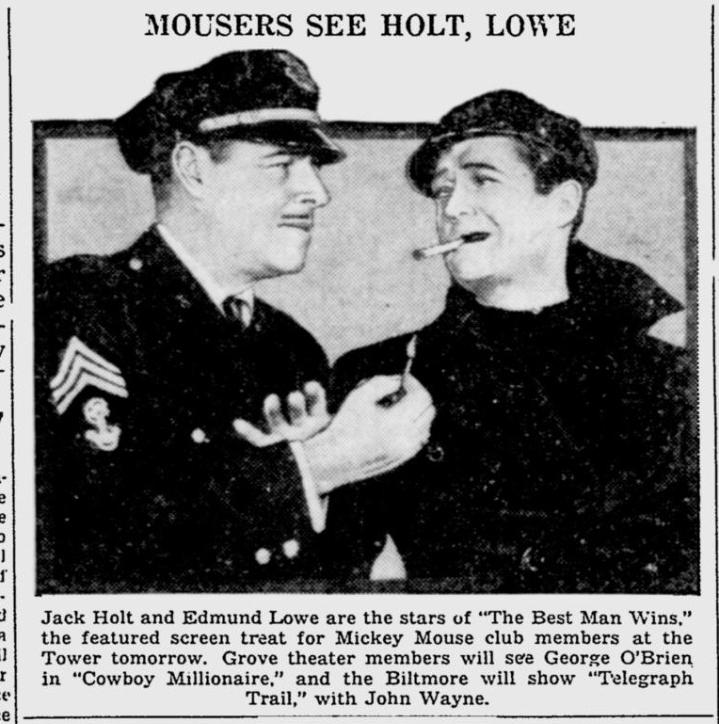 Coleman, Jr. 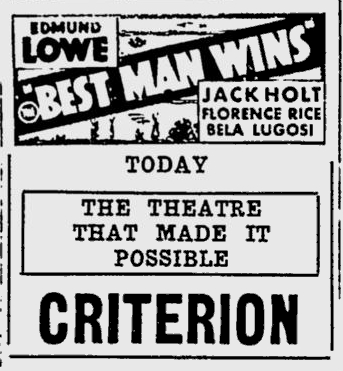 The first of the 1935 photoplays is content to leave the he-man situation about where it stood in 1910. 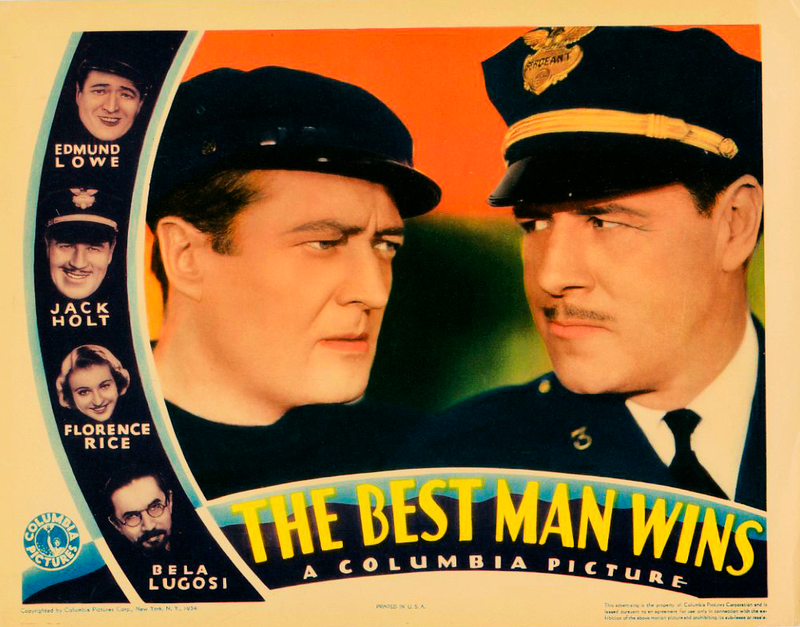 A minor dramatization of the qualities that accompany hair-on-the-chest “Best Man Wins” is a tale of submarine violence which unfolds amid the bubblings of the air lines and the fitful gleam of the acetylene torches. 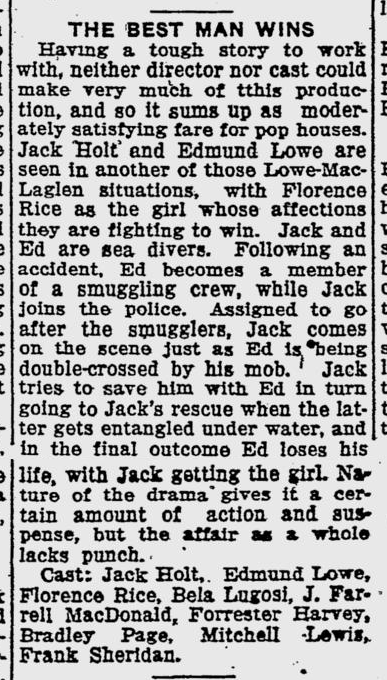 When Edmund Lowe and Jack Holt were salvage divers, their friendship was a beautiful thing. 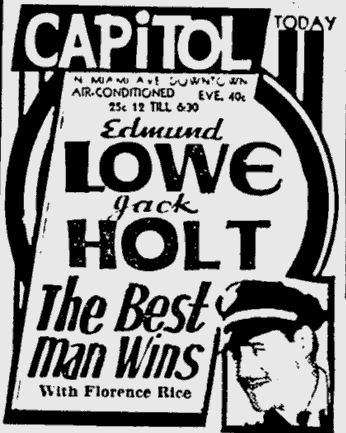 Then Mr. Lowe lost his arm saving Mr. Holt’s life and Mr. Holt became a copper. 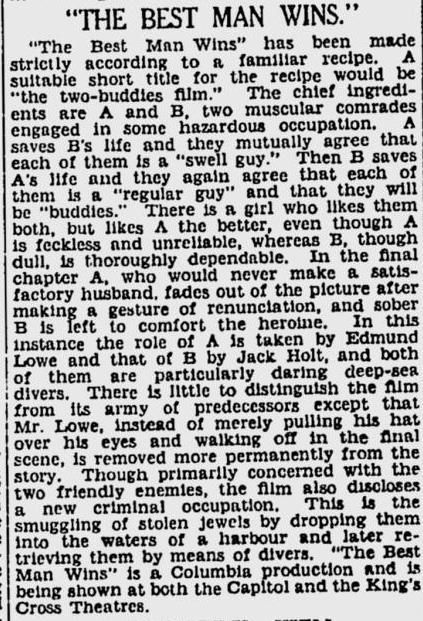 Resentful of sympathy, Mr. Lowe sank out of sight and joined the breadline brigade. 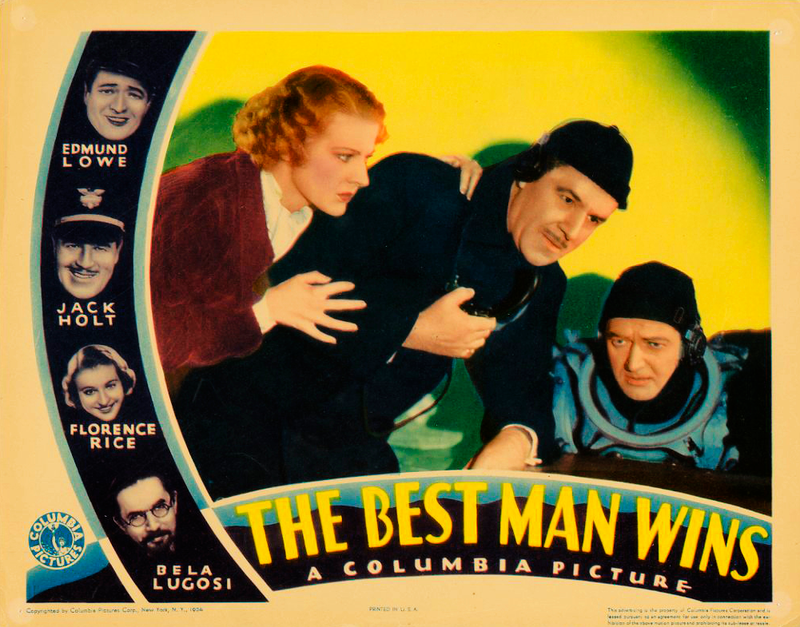 Unable to find work, he finally became a diver for Bela Lugosi, a cunning jewel thief. 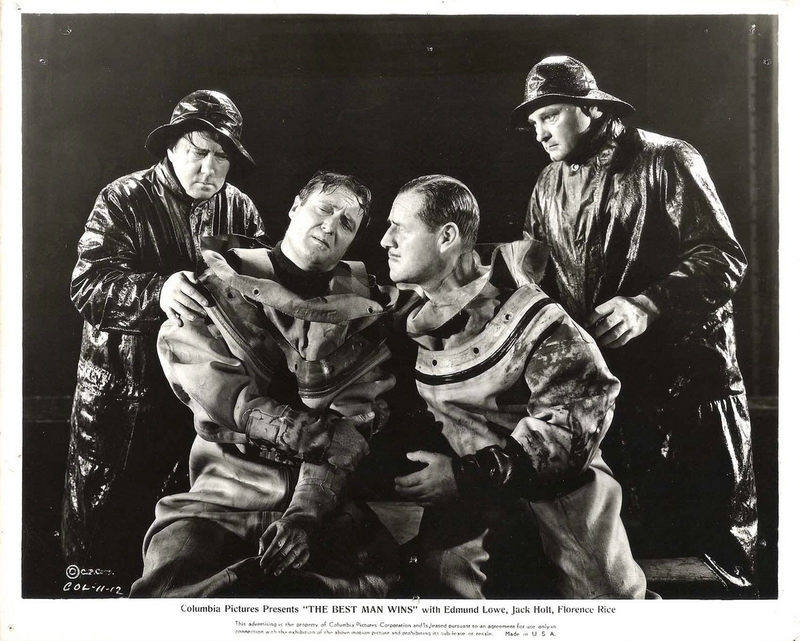 In the line of duty, Sergeant Holt came upon his old friend forty fathoms down and regretfully tried to bring him to the surface. 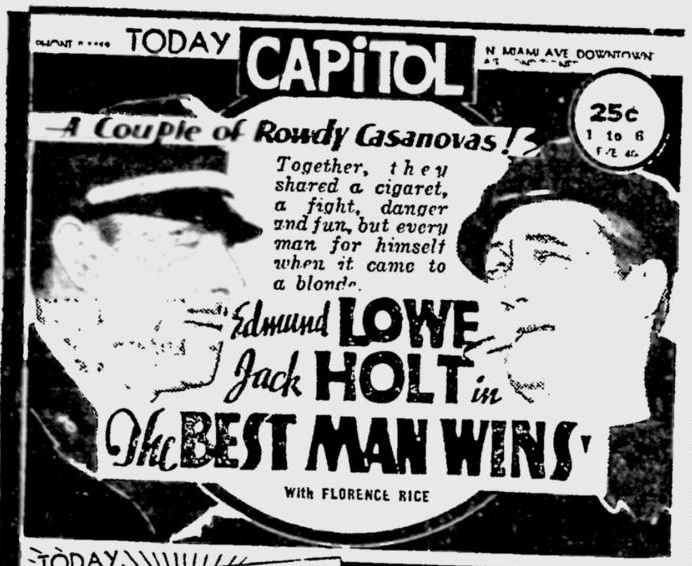 Thereupon Mr. Lowe, knowing that he faced a prison cell and not wanting to bring disgrace upon his innocent fiancée, cut the air lines and perished in the deep. 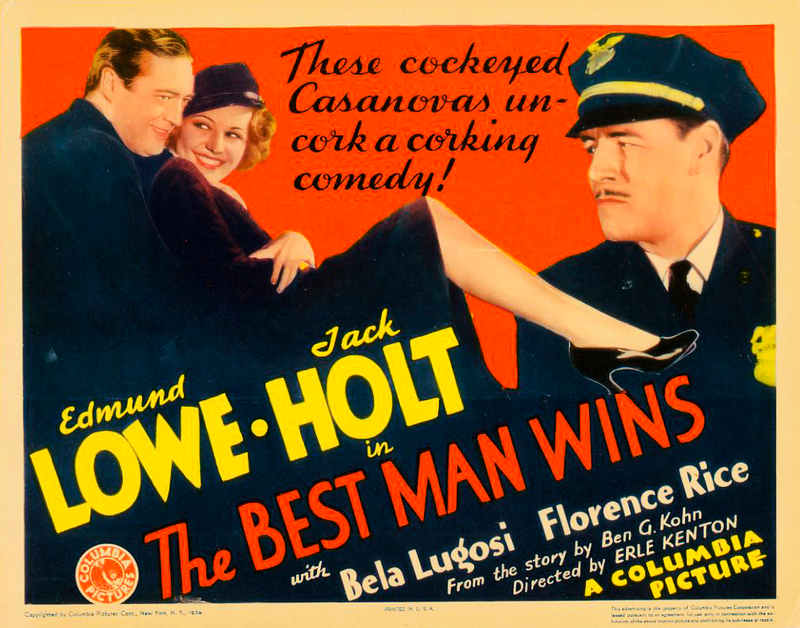 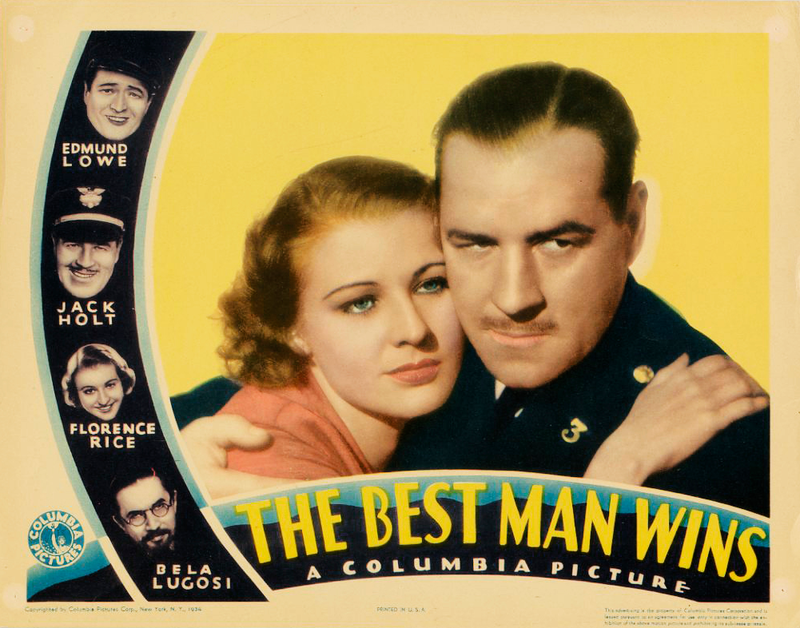 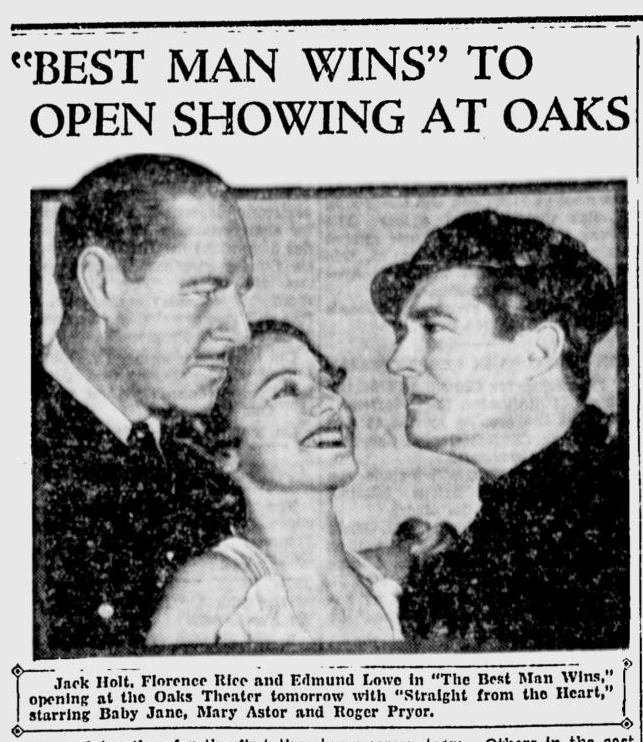 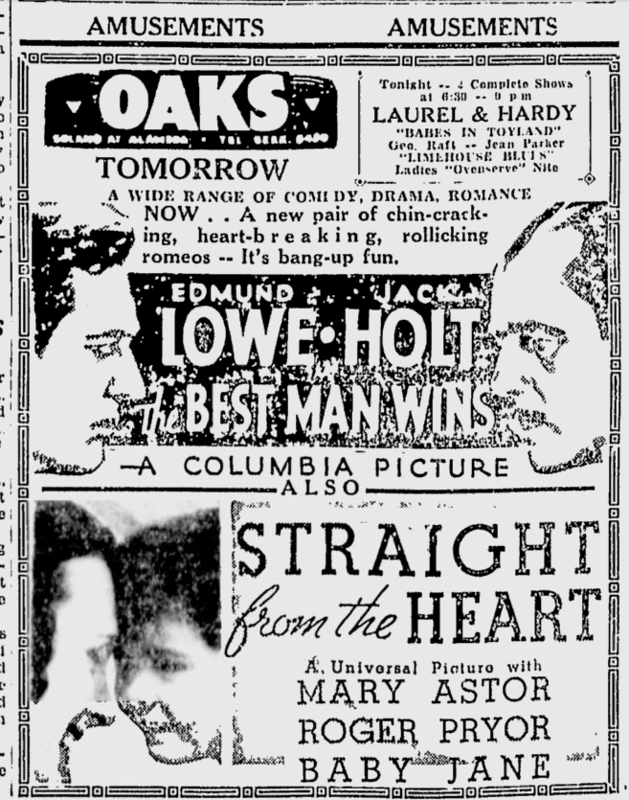 BEST MAN WINS, THE – Columbia – An interesting film with Jack Holt, Edmund Lowe and Florence Rice for romance, undersea adventures for excitement and Bela Lugosi as a menace.